Sister Mary Eileen (Lucian) Mackaness, CSJ, 90, died Monday, January 11, 2016, in her 71st year as a Sister of St. Joseph. The daughter of the late William and Julia McNickles Mackaness, Sr. Mary Eileen entered the Congregation from St. Joseph Parish in Bloomfield, Pittsburgh. For more than 25 years, she taught at Pittsburgh Diocesan schools, including Nativity School (1965-71) and St. Titus (1949-54). She also served at St. Andrew School in Columbus, OH, and St. Paul of the Cross School in Atlanta, GA. Following a year as a Social Service Minister in Tarentum, Sr. Mary Eileen served for 15 years as an Interviewer for the PA Bureau of Employment Security. From 1990-2000, Sister co-managed Clairvaux Commons in Indiana, PA, and then moved to the Motherhouse. 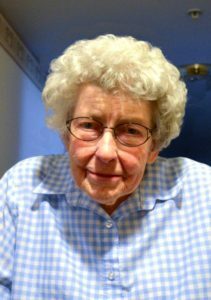 With a welcoming spirit, she served as the long-time receptionist for Villa St. Joseph and as a volunteer in the Congregation’s Development Office. Sr. Mary Eileen was known for her creativity and quick wit, which brought laughter and delight to others, and for her openness to whatever life unfolded for her. She will be remembered as gentle, compassionate and generous to those whom she encountered. Sr. Mary Eileen is survived by two brothers, Fred (Jean), Etna, PA, and Howard (Carolyn), Glenshaw, PA; a sister Mary Lou Hepner, Shaler, PA; nieces and nephews, grand nieces and nephews; and the Sisters of St. Joseph of Baden. Friends will be received Wednesday from 1- 8 p.m. and Thursday from 11 a.m. – 2:30 p.m. at the Motherhouse of the Sisters of St. Joseph. Prayer Vigil will be Wednesday at 6 p.m. at the Motherhouse. Mass of Christian Burial will be offered Thursday at 3:00 p.m. Burial will follow in the Sisters’ Cemetery on the Motherhouse grounds. Donations in the name of Sister Mary Eileen may be sent to the Sisters of St. Joseph Memorial Fund, St. Joseph Convent, 1020 State Street, Baden, PA 15005. Make a donation in memory of Sister Mary Eileen.